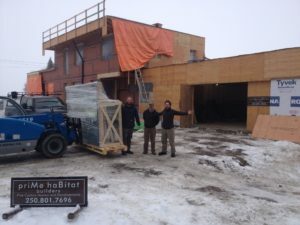 Kelowna Passive House Windows Delivered Today! Kelowna Passive House Windows Are Here! We are thrilled to take delivery of our Passive House windows today! Triple-paned, floor-to-ceiling beauties that will reduce external noise from traffic, planes, and any partying neighbours the owner may not want to hear. The priMe haBitat Builders staff have been waiting for this day…! Why Triple Paned Windows? They have unmatched efficiency, comfort, and thermal performance. These windows are handcrafted, triple-glazed and double sealed for an unmatched performance in airtightness and R-Value. Essential for Passive House design. priMe haBitat Builders is Kelowna’s Net Zero & Passive House Design | Build firm. For more information, visit www.prime-habitat.com.